ChromeCast Reviews - Is it a Scam or Legit? Based on numerous reviews we read during our research, Chromecast seems to have a mostly positive online reputation, primarily due to its “bank-for-your-buck” factor. However, some of the most common complaints we encountered included its inability to work with some electronics—including certain WiFi routers and Kindle Fire tablets—that streaming content directly from a Chrome tab is clunky and unreliable, and excessive lag. 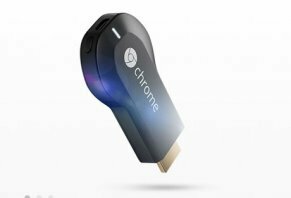 Google’s Chromecast is essentially a 2-inch dongle “stick” that connects to your TV via an unused HDMI port, and which allows it to play “movies, TV shows, music, and more from Netflix, YouTube, Hulu Plus, Google Play Movies and Music, and Chrome” (note: Google Movies and TV are supported for Android users only). The idea behind the Chromecast is relatively simple: In essence, it works just like an antenna, in that it has no built-in capabilities, but instead just captures a signal and routes it into your TV. Plug into any HDTV via an HDMI port, and power it up using the included USB adapter. Connect to your WiFi signal (be sure to have your password handy). Download the setup app for your laptop, smartphone, and/or tablet. As long as you’re using a supported app, Chromecast will allow you to pause, play, or browse your content, and you can use several units in one network, which will allow you to switch between TVs as needed. Unlike many other set top boxes, Chromecast automatically updates itself, so you won’t have to worry about constantly downloading new software. While setup and use appear to be relatively quick and easy, there are some downfalls you should keep in mind if you’re thinking about purchasing a Chromecast. First (and this is a big one) despite how the promo video might make it appear, you cannot send your photos, movies, or music directly from your electronic device into the Chromecast—in other words, there is no local media playback. Instead, you’ll access supported apps using your smartphone or tablet, which basically acts as a remote that will allow you to “cast” the content to your TV via the Chromecast. While you do have the ability to “cast” a Google Chrome tab and display it on your TV (which can include embedded movies), we read reports of the process being clunky, and that some file formats did not include supported sound. Also, we ran into several common complaints about the Chromecast during our research, including its inability to function properly using certain WiFi routers and Kindle Fire tablets, that streaming content directly from a Chrome tab is clunky and unreliable, and excessive lag. While you may be able to find the Chromecast for a couple dollars less expensive, it sells for about $35 through most retailers, including Best Buy, Walmart, Amazon.com, and more. Inexpensive way to stream some of your favorite programming from your devices to your TV using Netflix, YouTube, Pandora, Google Music, and HBO Go. Small, compact design makes it easy to take with you wherever you go. Reports of great image quality. Closely priced with the Roku LT, which has many more capabilities. Screen mirroring process is clunky. Very little support for content outside the U.S. If you’re looking for a neat little device that can add functionality to your TV—all at a very low price—Chromecast might be a solid purchase. However, it you’re expecting it to perform as well as some of the higher-priced boxes, you’ll likely be disappointed. Perhaps most importantly though, Chromecast may not be the sleek, inconspicuous gadget that its commercials make it out to be. This is because each unit requires power, which is provided via a USB adapter. As a result, you may have a new wiring dangling from your wall-mounted TV, and a slim-selection of content to outweigh the unsightly inconvenience. Roku beats ChromeCast hands down! I wouldn't suggest a ChromeCast to anyone. I wish I had done research before buying mine but the deal came with minutes to decide at a great price including a mini Google speaker with it. Which the mini we love. With that deal, I also had the option to purchase a Roku premiere, which I did. I gave the ChromeCast and mini as a Christmas gift to my teenager and opting to keep the Roku for myself believing that she was getting the better gift. I love my Roku Premiere, it's actually my 2nd Roku as I have a much older version in our family room. I had no idea that the ChromeCast required all content to be mirrored/casted from another device, thinking it was like the Roku. And assumed since it was a Google product more high end then a Roku. Boy was I wrong. I have friends with Firesticks too and hands down Roku is the best. Tons of free streaming of movies and TV shows. The only complaint is actually that networks like A&E or CBS require a paid membership or logging into cable company. If I had cable with the overpriced monthly bill I wouldn't need any streaming device. I've opted to spend my hard earned money elsewhere than an overpriced internet or cable programming. I know of so many that pay $100's a month claiming to be getting a deal bundling cable and internet that includes home phone. Really? Deal? I pay $10/month for high speed internet and stream anything I wanna watch along with data for other devices and $60/month for unlimited cell/4G service that i can use anywhere. That's $70/month for unlimited calls/texts/data including hotspot a Google 1 account for added storage AND a Prime membership than $10 for home Wi-Fi. I work hard and usually will research finding the best deal for my buck. With ChromeCast, Christmas had crept up on me and it was a take it or leave it deal at more than 50% off retail price that I let a brand name of Google persuade me, learning that not all big names equals best option. I have had nothing but problems with my built-in ChromeCast TV. I know others with the same problem. In order to cast from a different TV, you must factory reset your TV and device in order to reconnect each time. Your device will show casting to TV but will not cast. You then reset your TV but it won't give you an option because it is already saved in your device. You cannot delete the ChromeCast that appears in the list. There is also absolutely no support or help center, other than a few generic Q&A in regards to how to use it. Absolutely garbage product and even worse product service and support. I think everyone should get together and file a class action lawsuit against Google as it seems like absolutely everyone is having a problem with their built-in ChromeCast devices. When you stream from a tablet or phone, you get stoppages. If you like to watch video with pauses every 20-30 seconds then it's for you. If you just want to display your pictures on your TV, then by all means, buy it. Other than that, it's a waste of money! Their products stopped working with Slingbox/Slingplayer. Customer support is non-existent, and many many complaints from users are ignored. Roku works perfectly with Slingbox, plus Roku has many more streaming apps available. Don’t waste your money on ChromeCast. We got the 4k version. Installation was straightforward. But I guess what they say that 4k is still in development is true. The video was loading forever, and after a while we started getting huge lag spikes, and the only way to get rid of them is clear cookies every time. Overall, it depends on (personally) quality vs. speed, and as for me, it was a frustrating experience. I got ChromeCast as a gift from my kids in May of 2016. I was able to use my phone hotspot, so we got Hulu live, Netflix, and I could use YouTube. Then they pulled use of hotspot making everyone HAVE to get an outside WiFi source in order to use ChromeCast. They caused everyone to pay for services, Hulu, Netflix, Hulu Live, which cost extra, plus the cost of outside WiFi cost. If you can't afford the outside WiFi, ChromeCast no longer works. So the Chromecast cost us money, Hulu Live, Netflix, as well as YouTube live, and the outside WiFi. I think it's outrageous that they just shut it all down expecting us all to be able to pay all this extra money. I want to start a class action lawsuit against Google. I've already sent them emails and called with no response. I wish I could rate -5! Difficult to use, doesn't work at all with Amazon Prime. I purchased this along with a few other streaming players to do some comparisons. My experience with the ChromeCast has been pretty bad, but I don't want to dis it too much. First, you're required to have a smartphone to use this. There is no remote or manual method of managing the device. It can only be done from an app on your phone. Not necessary a show stopper, since most young adults never leave their phone out of reach. But the interface is clunky, doesn't work half the time, has some nifty ideas like "casting" your phone screen to your TV, but for all these neat gimmicks, if you just want to watch TV, you'll spend way more time trying to fight the thing than use it. Even though Google has a plethora of programmers to work on this product, it still feels like it is a year or more behind the Roku world. Its also what I would call slightly behind the Amazon Fire world as well, however, that's not too fair as both the ChromeCast and Fire are at the end of the pack by far. Part of the reason for this is that the two companies are battling one another and denying services between the two. As a consumer, I have little patience for corporate battles when something as cheap, and definitely a lot more polished is readily available. P.S. Good luck trying to return a device to Google. They are nowhere near as good as Amazon is in customer service. Google screwed us by deciding that we were are no longer going to use the $40.00 piece of crap that they sold us! Here's my complaint on RipoffReport.com. I suggest all ChromeCast users that are in the same boat go there and complain. Maybe some lawyer might decide to launch a class action lawsuit against Google. I bought Google's Chromecast about three years ago when they first came out, and it worked well until last week (in April 2017) when Google updated and got rid of its functionality on older computer systems. I had bought the ChromeCast to cast my laptop screen onto my TV, and that's exactly what it did, until now. Now I cannot use it anymore because I have a 2009 MacBook Pro with OX 10.7.5. My laptop works flawlessly and still looks new, to replace my system with a comparable new one would cost me a small fortune, and there is absolutely no reason that I need to. I have spent hours trying to fix this problem online along with many others that have been affected. According to Wikipedia, Google sold 30 million of these units to consumers. Last week they swindled more than just a few of them. There are plenty of other users that can't afford the latest and greatest and have to make do with perfectly good older machines, and there are millions of us who paid good money for this item which was working just fine, and with one fell swoop, Google has made our ChromeCast purchases worthless. I accept that older hardware and software cannot be supported, but I take exception to the fact that Google has purposely blocked my ability to use a product which they sold me, without my knowledge, but wirelessly with software. Does this mean that any corporation can decide if a product they sold you should just stop working? Will car manufacturers whose products are now loaded with software just stop working when they decide that you need a new one? Will Google's self-driving car, Waymo, just leave you stranded or will it drive you to some remote location first, when they decide their coffers need to be refueled? I received the ChromeCast thinking I could use it in my bedroom to cast YouTube and Netflix (I have an account) but after hours I found it does not work and it was a waste of money. I was trying to cast from Chrome with windows 10 and all I kept getting from 2 TV's was a message saying “can't cast”. The chromecast device is a rip off. I bought my ChromeCast device when it first came out. It has always been glitchy. Now as of 12/15/2015, it constantly drops connection after 20 minutes of use. I've tried getting help, none is available for the product. With the little help I did find, surmounts to me having to be a programmer, which I'm not. I do not recommend that anyone buy a ChromeCast device. ChromeCast version 1 just went in the trash. Could not reset it after changing routers. Followed all the directions twice to the letter. Worked pretty well on the old router after a very cloogy​ set up. Would give it no stars, if possible. Write a Review for ChromeCast!